As winter weather looms and the sun sets earlier every day, seek solace in the many Boston restaurants and bars that keep their dining rooms warm and toasty with flickering flames. 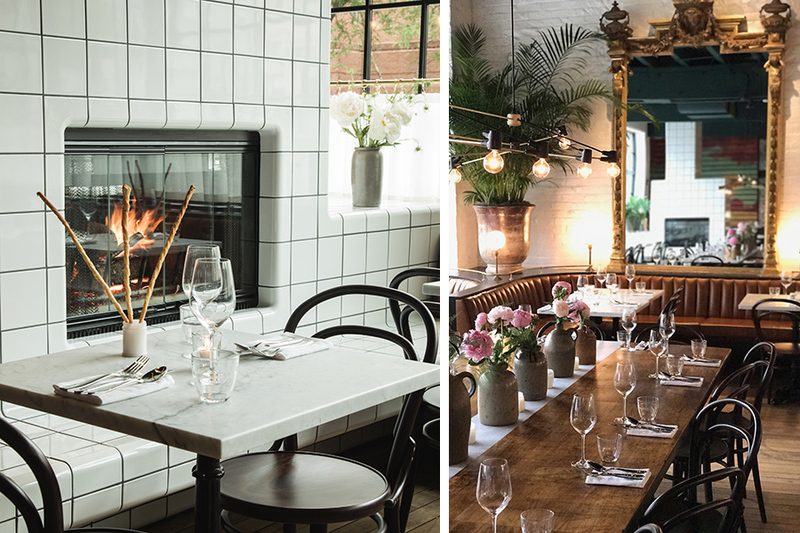 Whether you’re braving the cold for dinner, a date, or just a few drinks, let these neighborhood fireplaces light the way. Approachable plates like crispy herb falafel, cast-iron baked Brie, and cider-brined pork tenderloin are perfect for pre- or post-theater dining. Or, stop by during late-night hours for cinnamon doughnuts and a craft cocktail. Whatever your choice, the fireplace will be lit and welcoming in the upstairs lounge. 253 Tremont St., Boston, 617-451-2229, abbylaneboston.com. The stately dining room at this Back Bay steakhouse has been warmed by a glowing fireplace for more than 20 years. 793 Boylston St., Back Bay, 617-536-6300, abeandlouies.com. At the Ritz-Carlton’s downtown cocktail den, you’ll find caramel-hued finishes, burnished wood, and plenty of nooks and crannies for hiding away with a a house martini. Who can resist curling up in one of those leather chairs in front of the elevated, retro-chic fireplace? Medieval flourishes mix with hunting-lodge trappings at this brasserie. Massive rooms house ceiling-hung iron cages and antler chandeliers worthy of Gallic royalty. Adding to the regal ambiance is the great stone fireplace, a perfect backdrop to a feast of moules-frites and roasted duck à l’orange. This Provençal bistro has stellar crudo, an extensive wine list, and entrées inspired by coastal New England from award-winning chef Robert Sisca. Upstairs in the restaurant’s exquisite dining room sits a burning hearth, ready to accompany any meal. 272 Boylston St., Back Bay, 617-426-7878, bistrodumidi.com. What makes this Cambridge spot one of the most romantic restaurants around? Sweet sprays of fresh flowers on the tables and exquisite farm-fresh fare certainly help, but for mood lighting, nothing compares to flames flickering in a brick fireplace. The hearth here adds a whole new dimension of warmth to the already cozy surroundings. 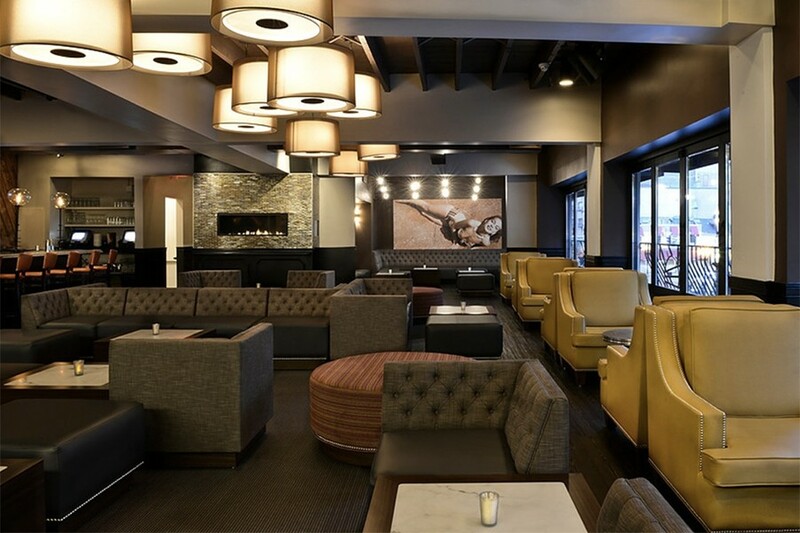 Big, comfortable couches make for a subdued but unpretentious atmosphere in this hotel bar. A good option for brunch, lunch, afternoon tea, and late-night dessert, the burgers at this Four Seasons restaurant are particularly noteworthy. Four Seasons Hotel Boston, 200 Boylston St., Boston, 617-338-4400, fourseasons.com. Short rib ravioli, rigatoni bolognese, and more await at this Italian eatery. 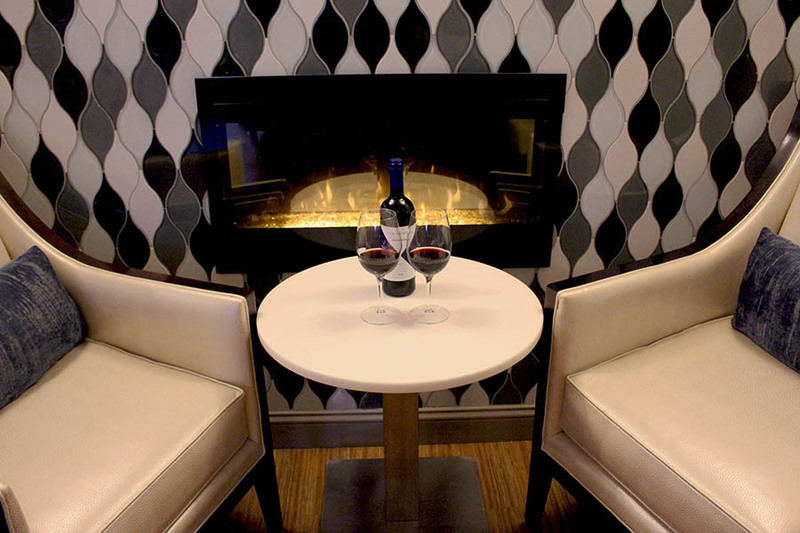 Grab a glass of wine and cozy up by the fire. 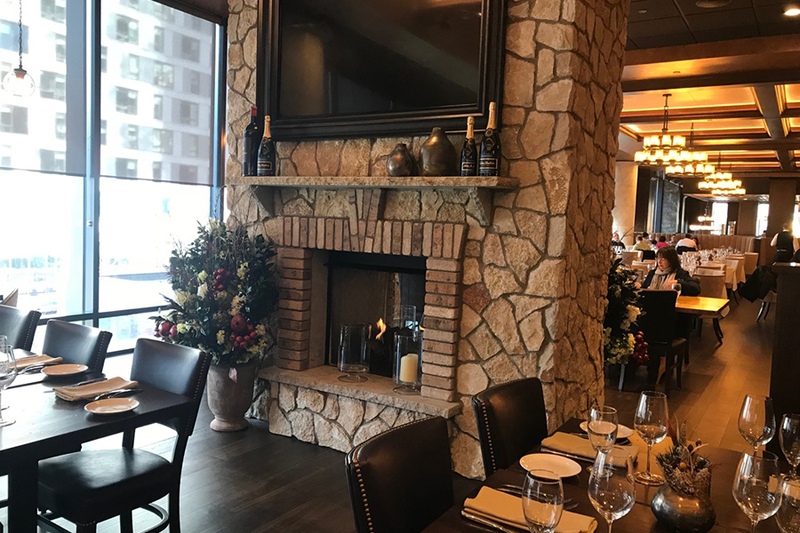 Right in Kendall’s Technology Square, this restaurant trades the rustic brick fireplace for something more cutting edge. It’s a sleek ribbon of flame, housed in a glass box, cutting through the lounge area. But just because it’s modern doesn’t mean it’s not inviting, as anyone who’s spent an evening basking in its warm glow would tell you. 300 Technology Sq., Cambridge, 617-576-3000, catalystrestaurant.com. Sometimes, keeping it simple is the only way to go. At Charlie’s, a menu heavy with hearty apps and loaded burgers make it easy to do just that. 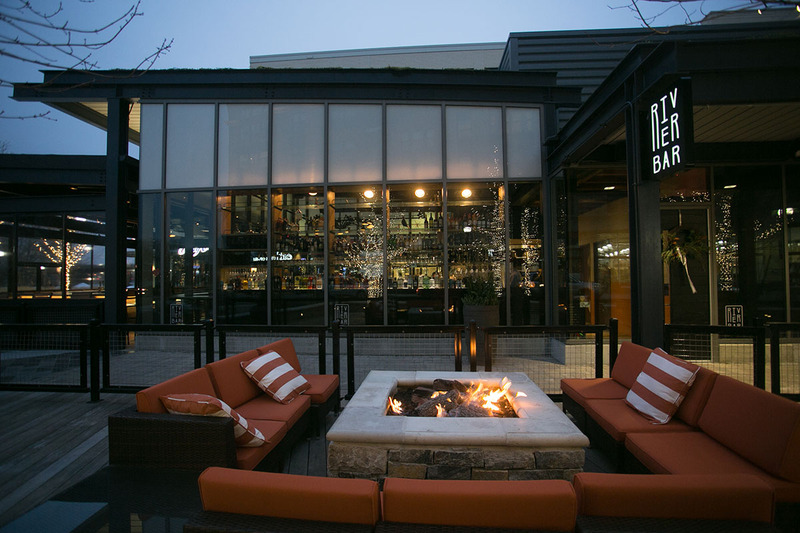 Trek outside to the restaurant’s (mostly) year-round beer garden, grab a drink, and let the outdoor fireplace do the rest. 10 Eliot St., Cambridge, 617-492-9646, charlieskitchen.com. It’s not just the vertiginously deep rosters of rye, bourbon, scotch, and Irish whiskey that keeps us warm at this Fenway neighborhood favorite. Behold that 100-year-old fireplace. Head to this convenient bistro for post-work apps, draft beers, and the glowing hearths warming the dining room and cellar function hall. 113 Dartmouth St., Back Bay, 617-262-9874, clerysboston.com. The neighborhood bar is one of our favorite Irish hangouts for a reason. A roaring fireplace makes it quite welcoming during the winter, and prime rib dinner every weekend complements the homey ambience. A cellar full of aged Bordeaux, sophisticated riffs on Parisian pastry-craft, and updated takes on classic cookery make this Back Bay spot a French favorite, but the blazing gas fireplace makes it especially welcoming during the colder months. 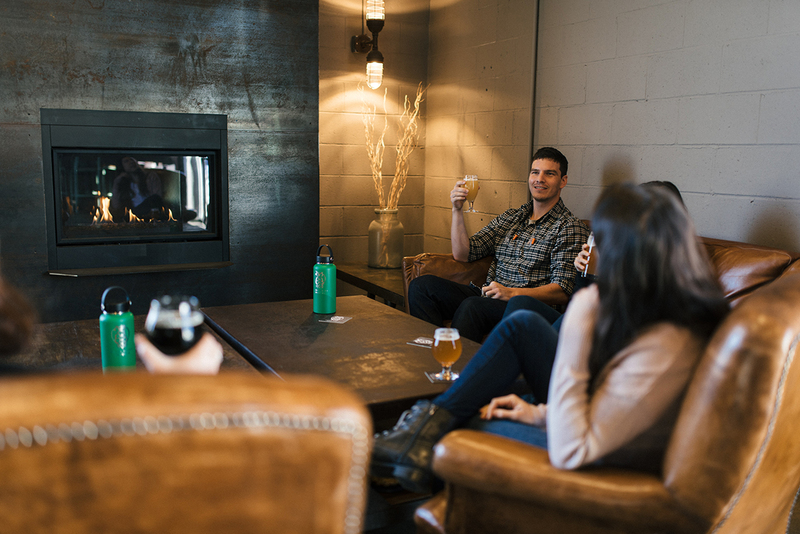 Exposed stone walls, pints of Guinness, and a hearty fireplace earn this Mission Hill bar a tip o’ the hat. Order a bowl of beef chili or clam chowder and post up. This funky basement bar puts a great spin on happy hour with half-priced food nightly from 5-7:30 p.m., and the large, dining room fireplace has comforted generations of Cantabrigians over decades in Harvard Square. 89 Winthrop St., Cambridge, 617-491-1160, grendelsden.com. At this high-ceilinged steakhouse, trust sommeliers to recommend wines for pan-seared halibut with a veal demi‑glace, the signature 18-ounce, 100-day aged prime ribeye, and other dishes served by white-coated waiters. The grand, fireplace-warmed room is also a holiday-season lunch staple. 61 Berkeley St., Back Bay, 617-542-2255, grill23.com. This Harvard Square landmark continues to draw students, professors, and other locals in with a menu of regional favorites such as a New England seafood boil, and beef strip loin with potato pave, smoked carrots, roasted onions, and beef béarnaise. Both the comfortable dining room and the outdoor garden terrace boast fireplaces. 44 Brattle St., Cambridge, 617-868-2255, harvestcambridge.com. Pearly glass tiles in marine blues and greens create the contemporary vibe at this North End spot, but the glowing fireplace in the lounge makes it just as snug as the neighborhood’s darker hideaways. A winter warmer cocktail with spiced whiskey helps, as well. 326 Commercial St., Boston, 857-277-1895, ilmoloboston.com. Tucked deep in South Boston, this watering hole is serving up contemporary American cuisine and plenty of house cocktails. Any stiff drink you order pairs well with the glow of the fireplace. Lobsters rolls, a raw bar, and bowls of seafood-laden gnocchi dovetail well with the outdoor fire pits. The hardest decision is just deciding what cocktail would vibe best with your night. 3 Mechanic St., North End, 617-723-6273, mareoysterbar.com. Inside the Everett brewery’s taproom extension, the Annex, a sleek bartop meets an even sleeker drinking space. 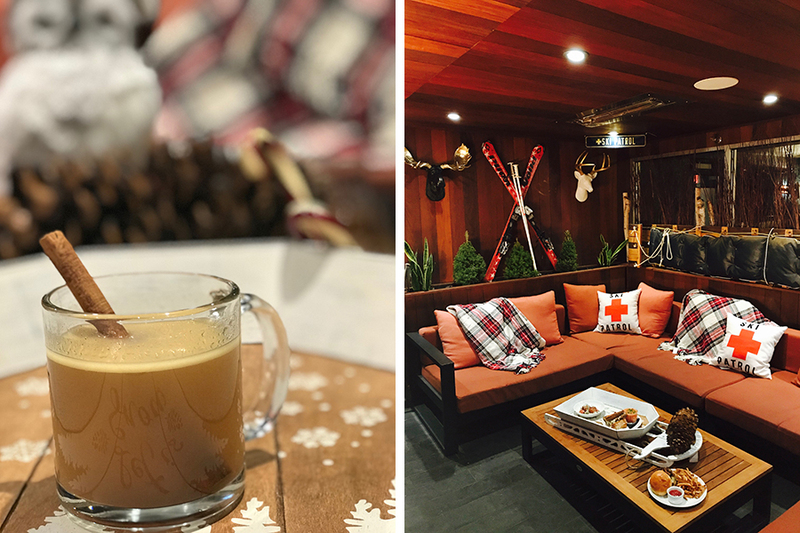 Head over to the lounge area, fashioned with leather couches and armchairs, and sip snifters of IPAs next to the gas-powered fireplace. You can’t miss the warm glow inside this elegant classic: There’s a fireplace located behind the bar. Alongside the glassed-in wine vault and original stained glass windows, the snug Red Room lounge has its own hearth, too. 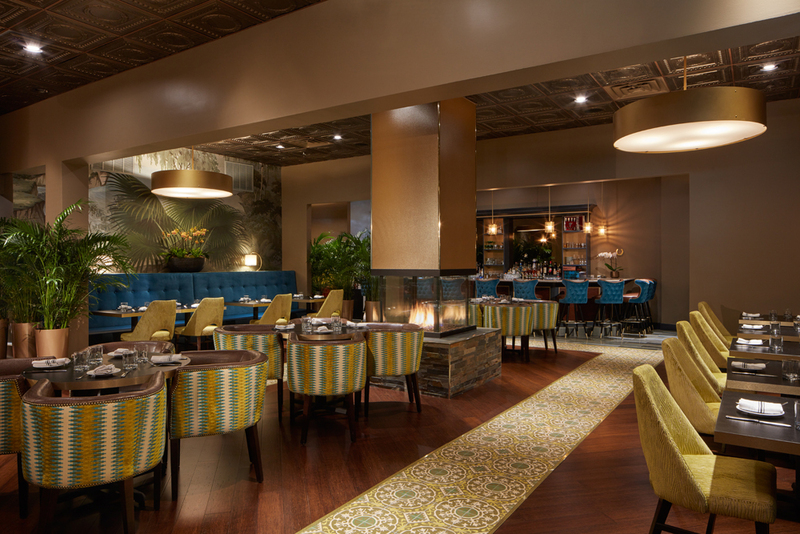 Fairmont Copley Plaza, 138 St. James Ave., Boston, 617-585-7222, oaklongbarkitchen.com. Through dishes like tuna and black olive deviled eggs and crispy lamb sarma, chef-owner Ana Sortun’s vivid Middle Eastern flavors ignite the senses, while the wood stove aglow in the dining room makes this Cambridge classic extra welcoming. Modern, sleek DTile (a ceramic from the Netherlands) wraps this dual-sided hearth. The heat it throws makes the communal table even cozier. 928 Massachusetts Ave., Central Square, 617-945-1761, pammyscambridge.com. The “classroom” space in this Harvard Square restaurant offers semi-private dining by the light of a glowing fireplace. Detour from the bustle of Harvard Square and seek out this glamorous, second-floor dining space. 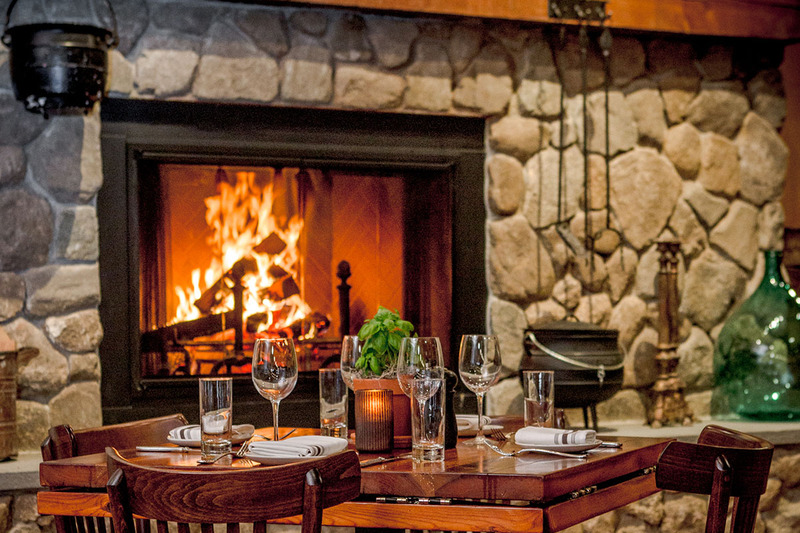 Even better, grab a seat next to one of the restaurant’s three fireplaces with a drink and an indulgent dessert. 91 Winthrop St., Cambridge, 617-714-3206, parsniprestaurant.com. A dependable neighborhood favorite since 1999, PJ Ryan’s cranks up the charm when the weather gets cold, thanks to their corner fireplace. And it’s not just the ambiance they’re serious about: They also boast a formidable beer list. 239 Holland St., Somerville, 617-625-8200, pjryans.com. 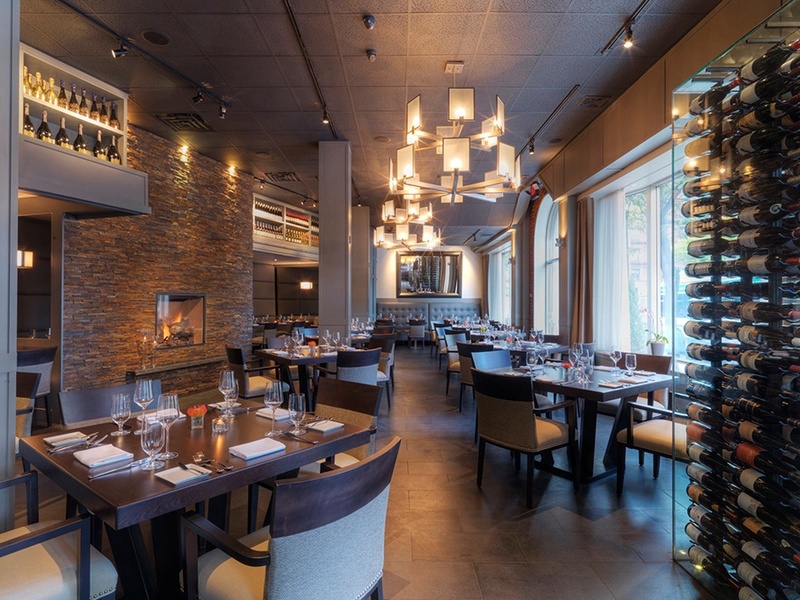 There are three fireplaces to enjoy inside this sophisticated tavern, on both dining levels. The relaxing atmosphere pairs well with crafted cocktails, charcuterie, and fresh oysters on the half-shell. 406 Stuart St., Boston, 617-399-0015, post390restaurant.com. The fire pits in this Southie spot’s year-round atrium are as welcoming on a cool summer’s night when the retractable roof is open as they are in the dead of winter. 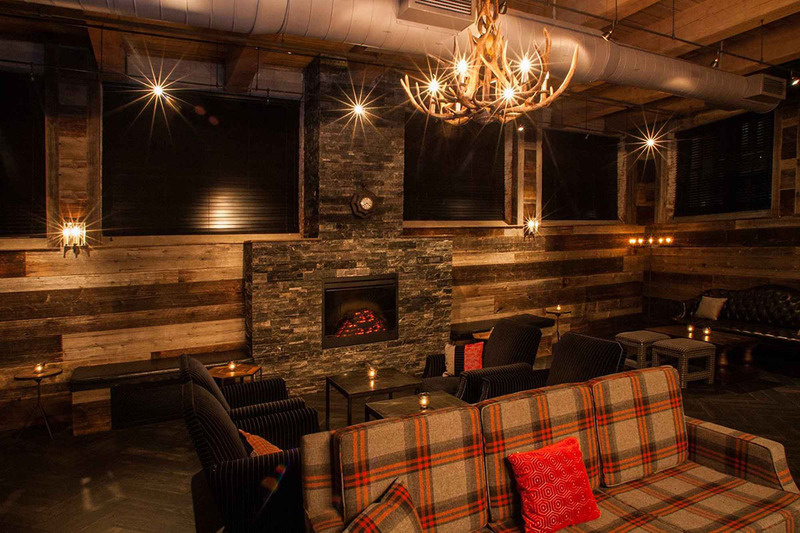 But when the Publico Garden is decked out in flannel blankets and plush pillows and as the après-ski-themed Lodge at Publico, the coziness can’t compare. Reserve a table in the downstairs dining room for an especially romantic meal—that’s where the fireplace is flickering. Lingering over a meal of osso bucco with handmade pappardelle, or the fresh catch of the day, you might forget you’re in cold, wintry Boston rather than the Sicilian countryside. The craft cocktails and small plates at this Assembly Row watering hole are best enjoyed on the restaurant’s covered patio, gazing out at the Mystic River. The outdoor fire pits ensure you can do so comfortably. The wood-fired Neapolitan pizzas and shareable fare at this Fenway neighborhood favorite make for great winter dining. In the comfort of the Club Room—aglow thanks to a four-sided glass fireplace—it’s hard not to have a few drinks and simply stay awhile. This 300-seat enoteca, wine and espresso bar has it all: Views of the bustling Seaport District below; authentic Italian cuisine like house-made tagliatelle al tartufo with shaved truffles; an open-hearth pizza oven; house-made gelato and artisan breads—plus a soaring stone fireplace that opens on both sides. 64 Seaport Blvd., Boston, 617-303-7300, tuscanbrands.com. This hotel lounge strikes a balance of hip but not exclusive, crowded but not cramped, loud but not obnoxious. We’re also quite partial to their retro-futuristic-looking fireplace. Pair it with a plate of duck-fat Parmesan fries, and you’ve got a serious winter escape on your hands. Finish up the day at this weathered tavern, one of the country’s oldest watering holes where Paul Revere and George Washington once drank. The historic haunt remains a Charlestown go-to for comfort food, cold brews, and live music. 2 Pleasant St., Charlestown, 617-241-8142, warrentavern.com. The cozy dining-room fireplace is just one reason this West Roxbury restaurant is an indispensable neighborhood gathering place. Weekend brunch, tons of gluten-free options, and Thursday night craft beer flights are some of the other reasons. 1732 Centre St., West Roxbury, 617-323-4199, westoncentreboston.com. Locke-Ober’s centerpiece hearth is preserved in the glam redux—roaring beneath the cheeky painted portrait of Bill Murrary in Yvonne’s library lounge. With reporting by Jacqueline Cain, Shaula Clark, and Alex Wilking.